“There are two ways to look at George Harrison. The nicer one is that he was a top-line and under-appreciated guitarist…, that he wrote at least two classic songs (“Something,” and “Here Comes the Sun,” two more than most songwriters write) and another half-dozen quite good ones….The other and arguably more realistic appraisal might be that George Harrison’s contributions as a guitarist were pretty much limited to a few Beatles riffs.” – Bill Wyman from Slate gets stuck into the Scorsese film. “One aspect that doesn’t shine through fully enough is his sense of humour.” – Martin Chilton in the UK Telegraph. “Paul McCartney described George as a “cocky little guy” and producer George Martin labeled him as “so cheeky.” – Rachel Ray, The Telegraph’s US TV reviewer. “….if you’re a big Beatles fan (I am), then it’s never going to lack interest…He looked inwards, chanted mantras, spent his life trying to forgive and give. A good egg, but no Lennon…” – Ben Walsh, The Independent. “With Martin Scorsese’s documentary about the quiet Beatle….it is time to appreciate Harrison as a teacher and a transmitter.” – Philip Goldberg focuses on George’s spirituality in The Huffington Post. “One facet of George Harrison’s personality that came into sharper relief for me during a preview screening of Martin Scorsese’s documentary was his role…as a provocateur.” – The LA Times Randy Lewis. 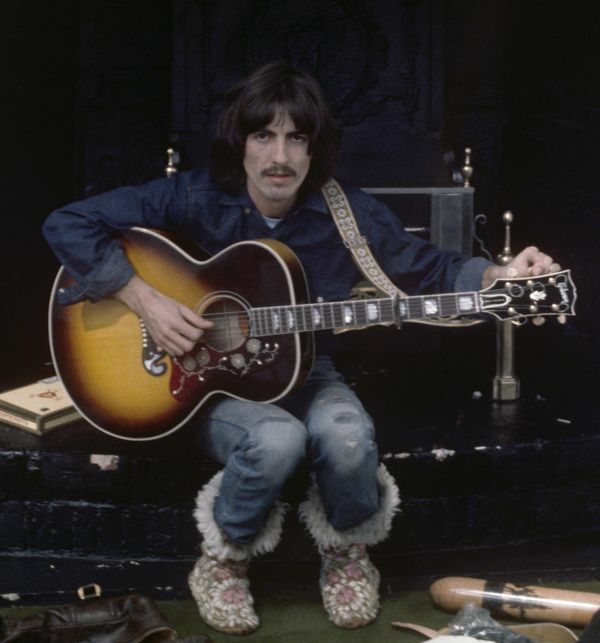 “In Martin Scorsese’s documentary “George Harrison: Living in the Material World,” Harrison’s journey is traced as a search for himself in the tumult of incoming distractions.” – Roger Ebert in The Chicago Sun-Times. And finally, not so much a review but another interesting article about George’s spirituality in the film from The Washington Post. This entry was posted in Beatles, Beatles Music, Beatles Related, Beatles related DVD, George Harrison and tagged Abbey Road, Beatles, Beatles Related, George Harrison, George Martin, Living in the Material World, Martin Scorsese by beatlesblogger. Bookmark the permalink.